Apple rival Microsoft's revenues were up 13 percent year-over-year to $23.3 billion in the June quarter, with profits of $6.5 billion —driven largely by its cloud and Office businesses however, as some hardware efforts struggled. Microsoft's fifth-generation Surface Pro came too late in the quarter to help. Revenues in Microsoft's "More Personal Computing" category dipped 2 percent to $8.9 billion, noted. The category covers Windows, hardware, Xbox, and search and advertising. The fall was largely because of the Surface PC line, which itself slipped 2 percent. Up until the last two weeks the line was mostly stagnant, riding mainly on the Surface Book and 2015's Surface Pro 4. 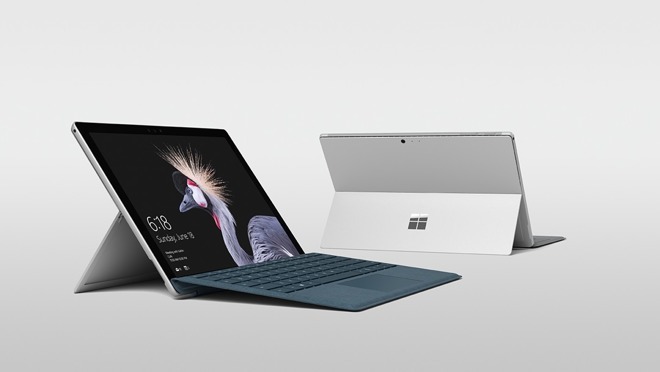 It's only then that Microsoft began shipping an updated Surface Pro, as well as the new Surface Laptop. Phone revenues were effectively nil, as with the previous quarter. The global smartphone market is now largely split between Android devices and Apple's iPhone, and Microsoft has all but abandoned efforts to take ground. The company lists just five phones on its website, one of which runs the defunct Windows Phone 8.1. Windows OEM sales were flat outside of the professional market, but still did better than the consumer PC industry, mostly because of a shift towards high-end systems. Apple's Mac shipments fell 0.4 percent year-over-year in the June quarter. The company nevertheless rose a spot to fourth place in the PC market, claiming 6.9 percent of it. Windows PC makers HP, Lenovo, and Dell held the podium.